HomeWhat is the Legion of Mary? “The Legion of Mary is an association of Catholics who, with the sanction of the Church and under the powerful leadership of Mary Immaculate, Mediatrix of all Graces (who is fair as the moon, bright as the sun, and – to Satan and his legionaries – terrible as an army set in battle array), have formed themselves into a Legion for service in warfare which is perpetually waged by the Church against the world and its evil powers… The object of the Legion of Mary is the glory of God through the holiness of its members developed by prayer and active cooperation, under ecclesiastical guidance, in Mary’s and the Church’s work of crushing the head of the serpent and advancing the reign of Christ” (Legio Mariae, pg 9, 11). The Legion of Mary was founded in the 20th century through the efforts of an Irish layman named Frank Duff. Duff was a member of the Society of St. Vincent de Paul, an organization of men who did various works in assisting the poor in Dublin. It was here – by coming into contact with those who were most in need – that the words of Christ became real to him: “As you did it to one of the least of these my brethren, you did it to me” (Matthew 25:40). He came to realize that by serving the poor he was actually serving Christ Himself. 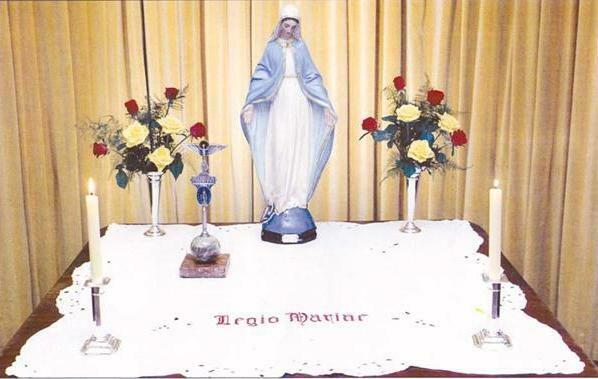 An altar of the Legion of Mary, similar to the altar set up at the first meeting. At one point, Duff became aware of a group of women who wished to do some of the works of the Society. So, on September 7th, 1921 he arranged for a meeting at Myra House in Dublin. This meeting was to set the standard of every Legion meeting that followed. A statue of Our Lady of Grace, surrounded by a pair of candles and a pair of flower vases, was set upon a tablecloth at the head of the meeting table. After praying an invocation to the Holy Spirit and the Rosary, the members discussed the needs that they saw in the community and that they wished to address. Seeing as there was already a large focus on the corporal works of mercy, the group decided to focus on the spiritual works of mercy as a means to reach souls and serve Christ. The members returned every week to report on what they had done and to discuss any problems that had arisen. Each meeting that followed to this day mirrors the model of the first: the recitation of prayers to the Holy Spirit and the Rosary before an Altar to Mary, followed by the discussion of works. This group was originally called the Association of Our Lady of Mercy, but, after prayer and deliberation, the name was changed to the Legion of Mary. By its very name, the Legion is a fighting unit, an army of the Blessed Virgin, focused on the victory of Mary and the defeat of Satan through prayer and works. The primary means that the Legion does this is by placing itself under the guidance and protection of Mary and, in so doing, is guaranteed her might and her victory in the spiritual battle for souls. At the heart of Legionary devotion is the devotion to the Holy Spirit, the spouse of the Blessed Virgin. Like the Church, the Legion relies on the Holy Spirit in the apostolic action, depending especially on Mary’s unique intercession because of her special union with the Holy Spirit. 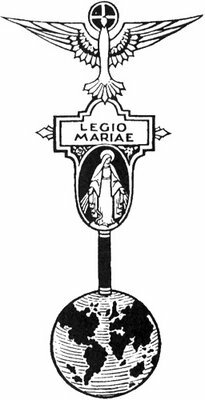 As our Mediatrix, the graces of the Holy Spirit flow through Mary and are distributed to all on earth by her (as reflected in the Legion’s vexillum – or standard – and tessera image). Through the distribution of these graces, the very heart of the Legion’s works – evangelization – is brought to life and given new meaning. “The faith that is wanted, the real faith, does not mean an empty sentiment, but an action. It very definitely means action – seeing God, and souls, and hardly seeing anything else; then pursuing those ends with absolute determination, with complete forgetfulness of oneself, of one’s own interest and one’s own safety; prepared to press after them, even if one’s own destruction be entailed” (The Spirit of the Legion of Mary, pg 18). A great example of this faith is found in the mass conversion of Bentley Place, a large red-light district in Dublin where prostitution was widespread. The place was in such a bad situation that the police focused on just containing the problem, rather than trying to break it up, for fear that – if disturbed – the problem would spread to other parts of the city. Priests were afraid to walk there, not wanting to cause scandal. Thus the legionaries, led by Duff, launched an “attack” and, after two years, cleansed the entire place “utterly and absolutely, not by human devices but by grace; not by driving forth but by converting; and not alone converting the girls themselves but the organizers as well – all were gathered into the net” (DVD: The Spirit of the Legion). As a part of the Legion of Mary, the legionary – by abandoning himself to the Holy Spirit through Mary – acts as the instrument of the Virgin here on earth. By uniting himself so completely to the Blessed Mother, he becomes more like her and is filled with her own desire to bring all of her spiritual children to her Divine Son. Through a steadfast faith, the legionary follows this call to serve the Mystical Body of Christ, bringing about the conversion of souls and crushing the head of the serpent through the special graces bestowed upon him by the Mother of all grace. “And so, imitating her, thanking her tenderly, rejoicing and sorrowing with her, giving her what Dante calls ‘the long study and the great love,’ bringing some thought of her into every prayer and work and act of the spiritual life, forgetting itself and its own resources to depend on her; the soul of the legionary becomes so filled with the image and thought of her that the two are but one soul. The legionary, lost in the depth of Mary’s soul, shares her faith, her humility, her Immaculate Heart (and hence the potency of her prayer), and swiftly is transformed into Christ, which is the object of all life. While on the other hand, in and through her legionary, Mary participates in every duty and mothers souls, so that in each of those worked for and of one’s fellow-workers, not only is the person of our Lord seen and served, but seen and served by Mary, with the same exquisite love and nurturing care which she gave to the actual body of her Divine Son. Its members thus grown into living copies of Mary, the Legion sees itself in truth a Legion of Mary, united to her mission and guaranteed her victory. It will bring Mary to the world, and she will give light to the world and presently set it all ablaze” (Legio Mariae, pg 26-27).